The Friends of Music Series at SFA will feature a performance of the Amethyst Saxophone Quartet at 7:30 p.m. Friday, Nov. 30, in Cole Concert Hall. NACOGDOCHES, Texas - The award-winning Amethyst Saxophone Quartet will perform at 7:30 p.m. Friday, Nov. 30 in Cole Concert Hall on the Stephen F. Austin State University campus. 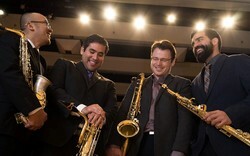 One of the premier American saxophone chamber ensembles, Amethyst Quartet includes Dr. Nathan Nabb, professor of saxophone in the SFA School of Music, along with Sean Hurlburt, Masahito Sugihara and Johnny Salinas. The quartet has won first prizes in the most prestigious chamber music competitions across the nation, including the Fischoff National Chamber Music Competition, the Coleman Chamber Music Competition and the Music Teachers National Association. Amethyst Quartet is known and celebrated for its performances of works by composers ranging from Johann Sebastian Bach and George Frideric Handel, to contemporary composers such as György Sándor Ligeti, David Maslanka and Iannis Xenakis. Amethyst will present works by Maslanka, Carter Pann and Joel Love on their concert at SFA. Amethyst has had a long relationship with Maslanka and his music, being the first American quartet to present his now famous work "Recitation Book." "Maslanka's final composition for saxophone quartet, 'Songs for the Coming Day,' is a joint commission between Amethyst and nine other groups, and, while the entire piece is nearly 47 minutes long, we have chosen a few select movements to present on this concert," Nabb said. Pann's "The Mechanics" is a short, six-movement work that features music representative of the activities and objects that might be found in an auto mechanic's shop. According to Nabb, names like "Flywheel," "Belt," "Hoist" and "Trash" are just some of the titles meant to stir images in one's imagination while listening. Finally, Amethyst will perform a work that is new to the group. Love, a Houston composer, wrote "In Memoriam" after the passing of his father, and is an especially stirring piece, according to Nabb. "Though only about 12 minutes in length, it is a highly dramatic work, vacillating from moments of anger to delicate tenderness," he said. The concert is a joint presentation of the College of Fine Arts and School of Music and is a part of the Friends of Music Concert Series. Cole Concert Hall is located in the Tom and Peggy Wright Music Building, 2210 Alumni Drive.